I suggest that you toss your regular iodized salt and make up some of this great-tasting seasoning instead. Of all the people on earth, the Japanese live the longest. Gomasio is what they grace their tables with, rather than the white sodium chloride we sprinkle on our food every day. With gomasio, you can reduce sodium while adding calcium, magnesium, iron, protein and fibre to your next meal! Gomasio is made by lightly grinding dry-roasted sesame seeds with sea salt. You can purchase it prepared from health food stores, though it's also easy to make – fresh-roasting your own sesame seeds ensures the healthy oils are preserved, providing you with the best nutrition. 1. Sesame Seeds are great for high blood pressure. 2. Sesame Seeds are good for your heart. 3. Sesame Seeds are an excellent source of calcium. 4. 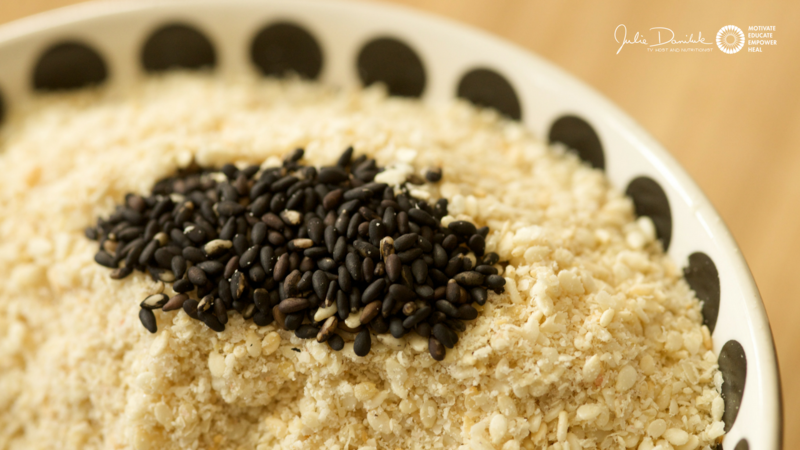 Sesame Seeds help to support your immune system. 5. Sesame Seeds support lung function. Place seeds in a clean, dry frying pan and toast on low heat, stirring often, until warmed gently (10-12 minutes). The longer, lower-temp toasting will result in more even heat distribution that reduces damage to the oils in the seeds. Allow the seeds to cool for about 10 minutes, then place in a small electric grinder with the salt and pulse a few times until most of the seeds are cracked open. Be careful not to grind into a flour consistency; you want some of the texture of the seed to remain. If you don’t own a coffee/spice grinder, grinding it by hand with a Japanese mortar and pestle works well.